Hi Guys, although i made an account here a canny while ago, i havent been an active member. I'll be changing that. 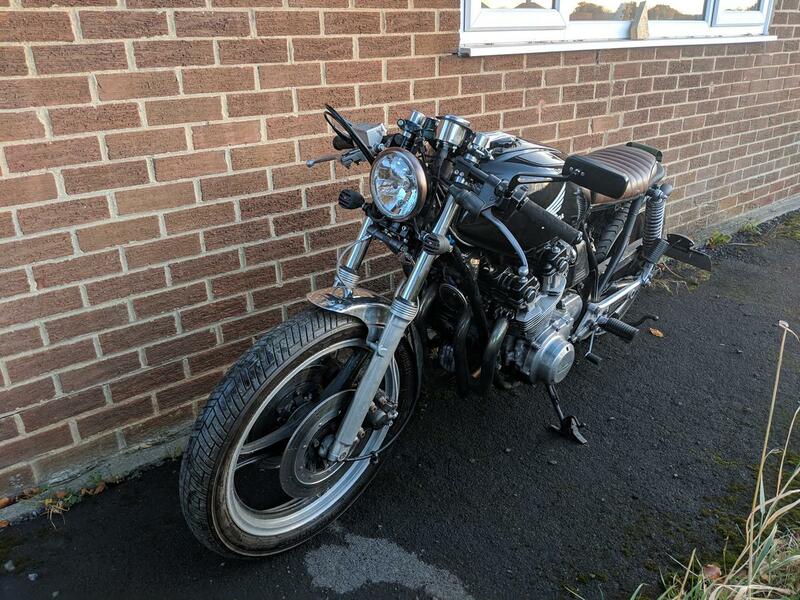 Picked up an '81 cb750 a couple of years ago now, stripped it and chopped the back end of the subframe off. Then life got in the way and i didn't even look at it until this summer. To be honest, the bike was fairly nice when I got it, but the devil is in the details and it was just a bit rough around the corners. The previous owner had made shortcuts that I wasn't a fan of. After a move, which meant I finally have a garage to work in, I've actually made a fair bit of progress in the last few months. first job was to sort the back end out. 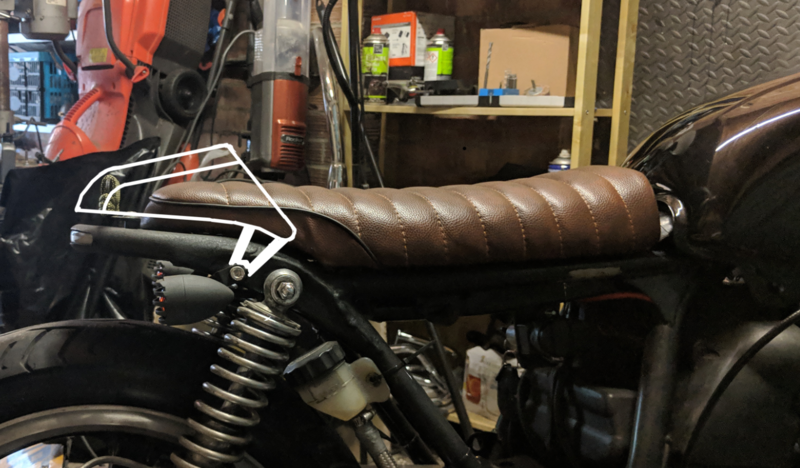 I've taken a cheap ebay seat and gave it a little trim so it matches up with shock mount hump. With that lined up, I could then measure up the rear hoop to suit. Before welding the lot together I cut a slot for an integrated rear light / indicators (yeah I know, overdone). I wanted to have a few mounting points on the back end for a removable rack and/or hump so I drilled and tapped the old M6 bosses to M8, plated the top of the hoop and added another couple of M8 weld nuts. While I was there I ground off the side cover mounting tabs and a few other bits. Grinder and paint make me the welder I aint! I do plan on stripping the bike back down to the frame at some point and getting the whole lot powdercoated, but that'll have to wait. For now I've just truck bed linered it. Next is the electrics. I've stripped back the loom and managed to move things around enough to fit most things into a small tray under the seat. That and the battery box have been my first tries and manual metal forming, so they're a bit rough around the edges. I've shortened the loom in places, but replaced anything ive cut off with new OEM connectors. Except for the fusebox, which ive replaces with a bunch of inline mini blade fuses. Front end next. Stock forks and wheel, just tidied up. I've replaced the headlight with a slightly smaller bates style one. Fabbed up a little bracket to bring it as close in to the forks as possible. Done the same with the indicators. Top yolk has had all extraneous taps cut off & smoothed. Ignition relocated to under the seat. For clocks I've just gone for a small analogue speedo and an array of LED warning lights for high beam, neutral, indicators and oil pressure. Now i'm at the point where I've got the majority of the mechanical / aesthetic stuff ironed out and i've just got to get the thing running. I've completely stripped and rebuilt the carbs, taken back to OEM jets and bench synced. Now's time crank and get the carbs properly balanced. 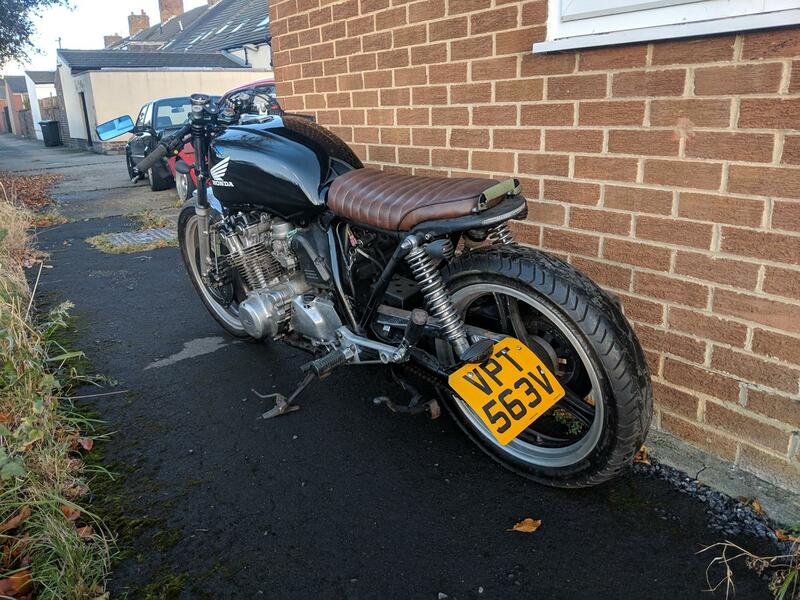 At some point i'd like to get some better forks and shocks, and when I strip the bike back down for powdercoat i'm tempted to rework it a bit with the odd bit of bracing / lightening. Any recommendations would be appreciated. Mr Tubes all day. Brilliant. Thanks mate, I'll have a look for some. I've been looking at shocks a bit and there doesn't seem to be many decent ones at a good price. Its either really cheap crap, OEM or high end racing kit. 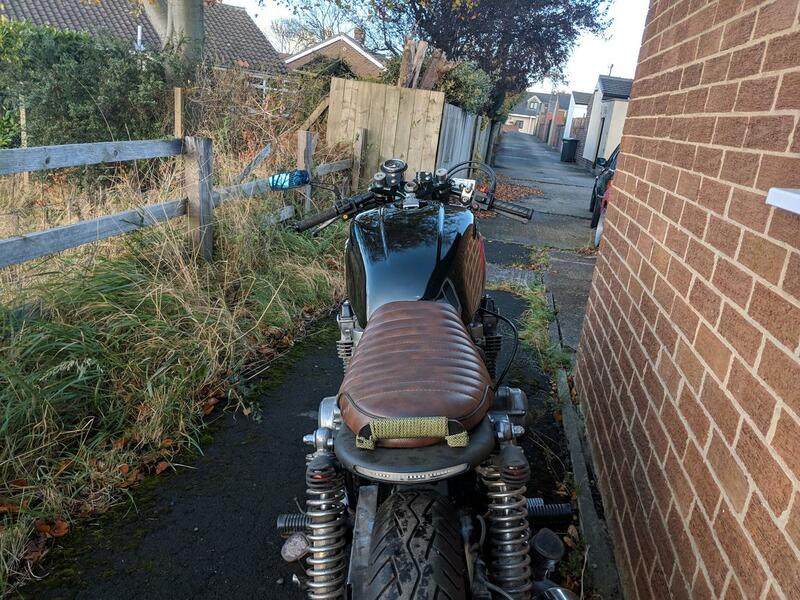 Not much of an update, but the bike's been out of the garage for the first time in over a year so I've taken a few pics. Also soldered up a small adaptor piece so I can run both indicators through one LED warning light. I'm not entirely happy with how the back end is looking. I've stapled up the seat cover offcentre so that needs re-doing for now. But longer term I think i'll make a new seat pan minimalist foam seat. Here's what I'm thinking for a small cowl. The idea is to make the skeleton from 6mm steel rod, then cover it with waxed canvas. If i think the 6mm rods seem stong enough, i'll also do a luggage rack i can swap out for some weekends away. Mocked up a hump frame. I thought the undercut was a good idea, but i think i prefer the photoshop from earlier. I'm thinking of getting some slightly longer shocks to jack the back end up a little, but obviously don't want to alter the head angle too much. stock is 28°, 30mm longer shocks should lower that by just over a degree. Probably closer to 2 if i drop the forks a little too, bring it down to 26° which is still more than a usual modern bike. Anyone see any issue with that? Sweet! I like what ya've done so far. Mr. Tubes is just beautiful as well. Lurker and dreamer. Maybe one day Ill start on my bike. Thanks! he's surprisingly effective too. Done a few little jobs here and there lately, but nothing worth posting up. 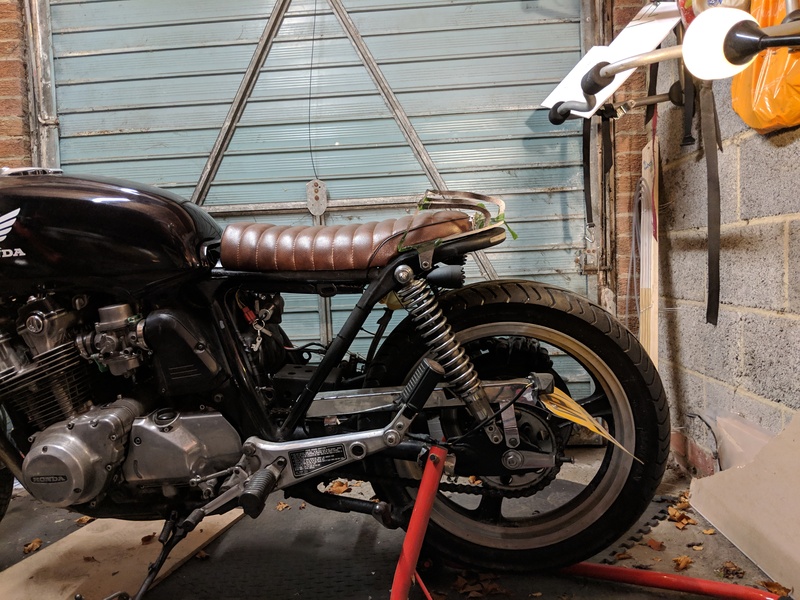 I think i'm going to do away with that seat and knock up a fibreglass seatpan and a closed cell foam seat, I just cant get away with the dodgy transition to the tank. I'd like to get a properly upholstered seat eventually, but the bank balance begs to differ. I just came across his build and I like it. I’ll go back to the beginning when I have more time. I like your seat. I’m working on a 79 CB750L(K) so I’m trying to follow all the same model builds on here. The main thing that I like is that you have resisted the urge to pod! Now, what I see as a challenge to some builder is a way to make the air box look better. I found that '78 GL1000 front (tripple trees and 37mm forks) drops right in, but I don't know that it is an upgrade. Still uses the same single-piston calipers. I used them on my '79 CB750F because I had them and the forks on it had been seriously made dangerous by a PO. Progressive springs are available for them, however.